Senate Republicans shot down Sen. Rand Paul’s (R-KY) clean Obamacare repeal bill on Wednesday. Sen. Paul’s bill failed 45-55, seven moderate Republican senators voted against the clean repeal bill. The Senate continues to try to coalesce around an Obamacare repeal compromise bill. 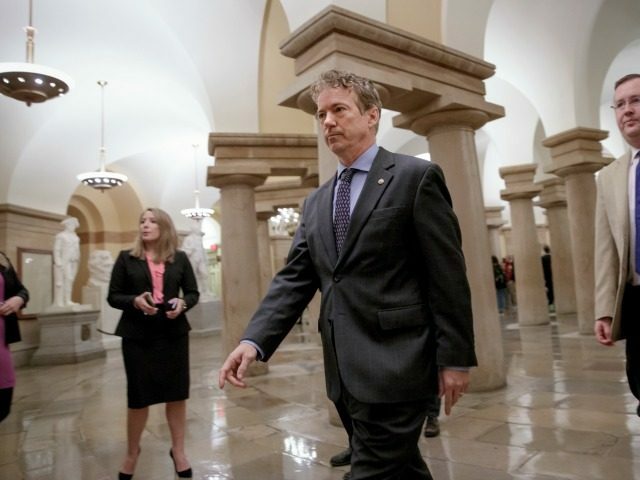 Sen. Paul consistently opposed the leadership’s healthcare bill, the Better Care Reconciliation Act (BCRA); the BCRA failed to pass through a procedural vote Tuesday night in the Senate. Paul offered his clean Obamacare repeal bill that would repeal large sections of Obamacare. Let me be very clear, large parts of Obamacare remain after this repeal bill today. What this bill does, though, is force both sides to come together to find a bipartisan solution during the two-year transition. The bill gives us a two-year window for both sides of the aisle to come together to discover how we can get MORE insurance for MORE people for LESS cost. The Kentucky senator argued that even with Obamacare, 27 million Americans cannot obtain health insurance and that half of those citizens cannot get insured because it remains too expensive. Paul contends that Congress should change insurance regulations to allow small businesses, credit unions, and professional associations to create insurance pools that would increase coverage and lower costs. In a way, Paul’s bill serves as a litmus test for Republican senators on repealing Obamacare. All current GOP senators except for Sen. Susan Collins (R-ME) voted for a similar Obamacare repeal bill in 2015. Only Sens. Collins and Lisa Murkowski voted against the motion to start a debate on repealing Obamacare on Tuesday. Paul’s bill will show how many senators truly want to repeal Obamacare. Sens. Dean Heller (R-NV), Shelley Moore Capito (R-WV), Susan Collins (R-ME), John McCain (R-AZ), Lamar Alexander (R-TN), Lisa Murkowski (R-AK), and Rob Portman (R-OH) voted against Sen. Paul’s clean Obamacare repeal bill. All of these senators except for Sen. Collins voted to rescind Obamacare in 2015. Conservative activist groups Americans for Prosperity and FreedomWorks urged Republican senators to vote for Sen. Paul’s clean Obamacare repeal bill. Senate Republicans will continue to offer different amendments and substitute legislation to try to come around a compromise Obamacare repeal and replace bill. Many analysts speculate that the Senate will try to pass a “skinny repeal” bill that would repeal Obamacare’s individual and employer mandate, as well as the Affordable Care Act’s medical device tax. After which, Congress can create a conference committee between the House and the Senate to reconcile the differences between the House-passed American Health Care Act (AHCA) and the bill that passes through the upper chamber. Senator Paul contends that even after repealing Obamacare, he remains committed to working with his Senate colleagues to replace Obamacare with a free-market alternative.